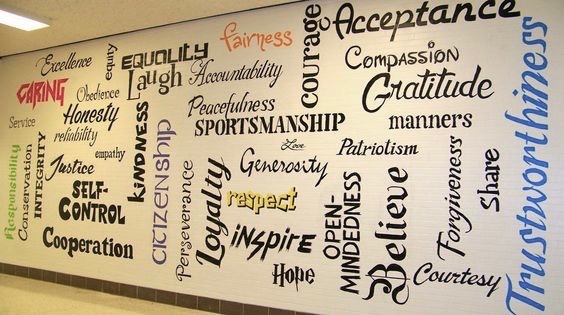 It’s as clear in my mind today as it was thirty years ago, in 1988, when we got a notice from our school district that the time had come to teach core values. They were calling it Character Education (CE); what it meant for me as a district employee was that I was to write into my lesson plans how I planned to integrate CE into our classroom habits and routines. A high school Spanish teacher, I remember thinking, “Would reminding them not to cheat as they’re conjugating their verbs on today’s quiz count as character ed. ?” I was at a loss; after all, I’d been hired to teach Spanish and, without training, I didn’t have a clear understanding of how or why I was being asked to weave core values into my weekly plans. Fast forward to the year 2000, when I had the opportunity to move from secondary education to a middle school campus. I phoned my friend Sally to ask what I could expect now that I wouldn’t be spending my time counting credits, reviewing transcripts, and helping students get in to college and she told me about this thing called Character Education. She suggested I attend a Character Counts! Character Development Seminar and it was a game changer. I went back to school with a deeper purpose, to put children’s hearts first, to change from teaching content first to teaching children first. A dozen years into my career as an educator, I had been given a chance to start over, a chance that has made all of the difference in who I am, a chance to do better at connecting with and relating to kids, a chance to form healthier relationships not only in the classroom, but in life. What are the benefits of an effective CE program to a school family? When our CE program at my school of fourteen years was at its peak, when we were intentional at weaving our core values into the very DNA of our school’s fabric, when we committed to dynamically shaping hearts and minds (in that order!) for the future, the benefits far outweighed the cost. As empathy increased, incidents of bullying behavior decreased; over a five-year period, we saw a 59% reduction in discipline referrals. Students routinely connected through morning meetings and conflicts were resolved through restorative circles. Attendance reached the gold-standard rate of 98.2 percent because students wanted to be at school. It felt good to grow in that climate of caring. State scores were at an all-time high (100% passing for reading; 94% passing for math) and volunteerism topped the charts with 240 hours clocked per week. Survey data told us that students felt like they mattered; teachers told us that they felt heard and valued. We had created a culture and a climate of caring and school life was positively inspiring for our students and stakeholders. And what are some of the CE benefits for individuals? Respectful interactions. When we focus on living by the Golden Rule, on treating one another like we want to be treated, our interactions with others are more respectful, understanding, courteous, and mannerly. We work with intention to resolve conflicts peacefully and we celebrate diversity and differences. We are considerate of each other’s feelings and deal peacefully with anger and disagreements. When respect goes up, bullying interactions go down. Self-regulation and self-esteem. When core values are in place and we know who we are and what we stand for, we’re more adept at self-regulating so our self-esteem naturally goes up. Our ability to respond (response-ability) becomes something we master well; we manage our emotions with relative ease. The more confidence we feel, the more confident we’ll become. Resilience and grit. Character education has a critical mindset component; when we learn to unlock our fixed-mindset thoughts and nurture our growth mindset, we accept mistakes as opportunities for growth rather than seeing them as a failure, as something that could break us. We are inspired by the success of others rather than threatened by it. We persist through problems, adapt to our circumstances, and bounce forward into our new normal to gain resilience and grit, soft skills which are more aptly called success skills important for life. Servant leadership. When we learn to think with their hearts, we naturally become servant leaders. Our elevated empathy mobilized compassion and we just want to be kind, to do good in the world, to make life better for everyone around us. We move from a life of ME to a life of WE. We want to serve others and our lives become more joyful as a result. And though it feels like magic, it’s actually science. Known as the helper’s high, it’s an endorphin release in our brains, that chemical rush we experience we’re living altruistically. Gratitude and positivity. When we show gratitude in all things, it can positively add years to our lives. According to the Templeton Foundation, positive emotions can add seven years to our lives. Additionally, grateful students get into 13% fewer fights and are 20% more likely to make A grades. Their research also shows that grateful people will have 10% fewer stress related illnesses, be more physically fit, and have blood pressure that is lower by 12%. Try keeping a gratitude list or naming three grateful things every day and see which of these benefits you can enjoy. Job opportunities. Employers are looking for responsible employees who have integrity, who choose to be in the right place at the right time doing the right thing. They select candidates who can shake hands with confidence, who look them in the eye, who passionately pursue excellence, and who have demonstrated a strong work ethic in all of their activities. Job applicants with ethical fortitude have an edge securing and keeping a place in the work force because their employers can count on them to show up and make a difference. Healthy relationships. When we work with intention to be honest, trustworthy people who keep our promises, show integrity, and never lie, cheat, or steal, it’s easier to make friends. Others can count on us and seek us out to align with us. Caring connections can be deeper, stronger, and healthier when the core value of trustworthiness is practiced daily and on purpose. On the flip side, when we learn to be vulnerable enough to trust, our relationships will be richer and, ultimately, our lives more fulfilled.